Looking to scrap your car? Morecambe Metals is an authorised treatment facility (ATF) for the depollution of end of life vehicles (ELVs). Morecambe Metals is an authorised treatment facility (ATF) providing vehicle recycling services for the depollution of end of life vehicles (ELVs). We have a purpose-built depollution rig, allowing ELVs to be depolluted to current legislative standards. When you want to scrap your car, your service includes the removal of tyres, battery, catalysts, fuel and all other vehicle fluids, so they can either be reused, recycled or disposed of correctly. All vehicles depolluted at Morecambe Metals will be deregistered and a Certificate of Destruction (CoD) will then be issued. As an ATF, we are committed to ensuring that we adhere to specific guidelines in order to conduct a proper and legal end of life recycling service. At Morecambe Metals, we are able to provide a certificate of destruction (CoD) for passenger vehicles and light goods vehicles that are under three-and-a-half tonnes. The certificate of destruction is an official DVLA document certifying that the end of life vehicle will be destroyed and recycled in the correct manner, and is updated live on the DVLA database, giving you customer satisfaction and peace of mind that your vehicle and paperwork has been dealt with quickly and effectively. Our comprehensive end of life vehicle recycling service is thorough, effective and eco-friendly. Our unique vehicle depollution process also ensures that all salvageable parts of the ELV are recycled or reused, making our services far more environmentally friendly than many of our competitors. 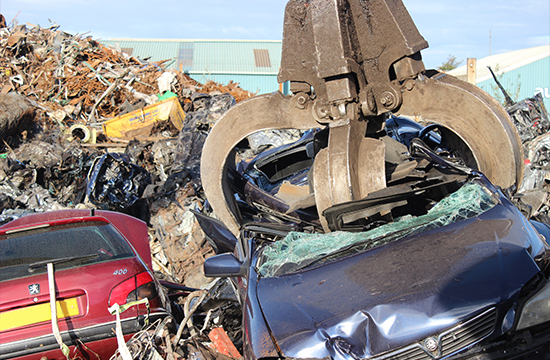 Morecambe Metals is your first port of call for fast, safe and cost-effective recycling for end of life vehicles. If you would like further information regarding Morecambe Metals’ vehicle recycling services, or if you would like to request a quote, don’t hesitate to get in touch with our friendly onsite team today. You can contact us by phone on 01524 69191 or by sending an email with your enquiry to info@morecambemetals.co.uk. Alternatively, you can take advantage of filling out and submitting the online form below, and a member of our team will get back to you as soon as possible.